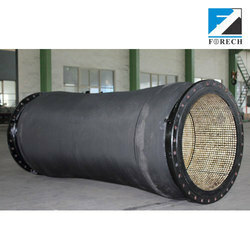 Leading Manufacturer of ceramic wear liners from New Delhi. Flexural Strength at Room Temp. (Mpa) 240 min. Abrasion by Impingement 0.05 grams max. Abrasion by Rubbing 0.1 grams max. Hardness (R 45 N) 79 min. Huge volumes of ROM and crushed material at very high transport speeds in conjunction with low angles of impact tend to accelerate wear which requires frequent change of lining surface resulting in costly down times.For such high wear and extreme applications, high-density aluminum oxide ceramic tiles have proven to be an excellent choice as a lining material.By embedding the ceramic tiles on to the rubber, it is also possible to achieve impact cushioning along with the superior wear resistance provided by alumina ceramic tiles. For light duty application, Forech provides a square/hex tile design with flushed tiles or with rubber between tiles that allows the product to be light and flexible. The gap allows for easy installation on both concave and convex surfaces. The size of the sheet can also be easily changed by cutting between the ceramic tiles and through the rubber-allowing you to customize the sheet according to your installation's needs. The back of the liner for light duty applications is provided with a Bonding Layer to strengthen the rubber to metal bond, as well as to reduce the time required to glue the sheet during installation.